Within a few years, it is possible that ordinary powerboats will appear out-of-time. Just like cars, powerboats will need to develop techniques to be less power-hungry and reduce emissions. This development will need to take into account not only engines and power-saving techniques, but basic concepts and hull shapes. The analogy with cars presents one major limitation: A car will consume a lot of energy when accelerated to its cruising speed, but once it is rolling at constant speed on flat tarmac it will need relatively little to maintain its speed. A powerboat, on the other hand, will need a constant supply of energy when running at speed, because of the resistance caused by its friction and wave-making. This resistance or ‘drag’ depends directly on its speed. This will limit what can be achieved by optimising engines and propulsion including the adoption of, for example, all-electric drivetrains. 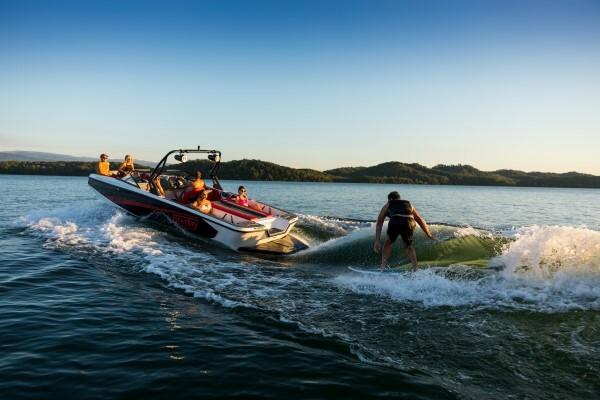 To illustrate the point, take a look at a powerboat intentionally built to create a huge wake, and using the wake for surfboarding. It is obvious that this kind of wave will not come out of nowhere; creating it will consume huge amounts of energy. One big factor which can be affected is the resistance itself. There is a new article here on optimising hull shapes, which obviously is one way to go. It focuses on the basic differences between hulls intended for planing speeds, and semi-planing speeds, and their respective limitations. Planing powerboats do not behave well at speeds below planing. Semi-planing powerboats cannot go at planing speeds. We have spent considerable effort to optimise powerboats to be able to go at any speed, both planing and semi-planing, and to do so with lower resistance. Finally, we were able to test the results in full scale, in the new Nautus 7-50.